Welcome to meltatotheface a tabletop wargaming blog covering the Gamesworkshop line of tabletop war games, including Warhammer 40k and Warhammer Fantasy. Content ranges from painting and modelling all the way to tactics and battle reports... enjoy. Warhammer 40K 6th Edition, so close you can smell it. 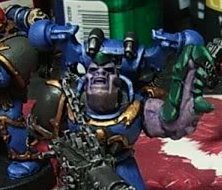 40k Rumours – Chaos Space Marine Dragon!